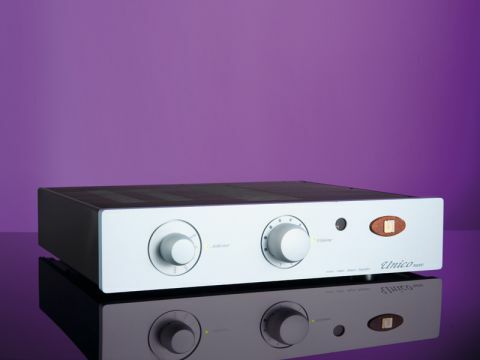 The Unico Nuovo ('New' in Italian) is a second generation integrated amplifier. For those familiar with the breed, the Nuovo is based on the original Unico 80 hybrid that was introduced as far back as 2001. Despite its relative antiquity, the original amplifier had a timeless aesthetic quality that has hardly needed updating for the second decade of the millennium. It was a modern amplifier then, albeit one with classic qualities, and it remains so today. The fundamentals of the Italian-made Nuovo haven't changed that much. It is still a hybrid design, with the preamp powered by thermionic valves, with a beefed-up MOSFET power stage in charge of the output. But there are significant changes. The Nuovo continues to use a single triode stage for each channel, but the active devices have changed from an single triode ECC82/12AU7 to ECC83/AX7 twin-triode tubes. The higher gain tube, when carefully matched to the MOSFET power amp gain stage is claimed to improve performance and accentuate the valve-like qualities of the overall design. A new biasing circuit, derived from phono step-up design practice, uses something called ionic bias which is said to uncover 'finer tonic nuances'. The bias point is self-adjusting, which eliminates an important point where performance drift would otherwise occur. A further change is that the power amplifier MOSFET complement has been doubled (though headline power output is unchanged at 80 watts per channel), which combined with a change to the novel constant power supply design, offers an easier, more relaxed quality at elevated power levels and more dynamic headroom – claims which seem easily justifiable on test. The amplifier has five line inputs, including one tape circuit, though one of the line inputs can be converted for use as an MM/MC phono input (it's already identified as such, though it operates as a standard line output unless this extra cost option is implemented). Two pairs of loudspeaker terminals are also provided for bi-wiring. One intriguing departure from normality is, that in addition to the usual speaker output, there is a line output that tracks the volume control (unlike a standard tape output for example), which can be used to drive a subwoofer. This may not be standard practice in the high-fidelity realm, but it opens up the possibility of using relatively small, very high-quality, narrow bandwidth speakers, with one or even two subwoofers to broaden the reproduced bandwidth. From the outside, there is more than a hint of Copland-style aesthetics here. There are the same elegant, simple lines, the same honed-down quality – there is nothing here that isn't required – and the same absolute focus on the fundamentals, with one minor exception. There are only two controls, volume and an input selector, each associated with a discreet LED which will warn you when the unit is powering-up, if the protection has been triggered, or if it is running. The back panel has similar restraint, as already described. The fascia is a pleasing aluminium extrusion, with a non-reflective sandcast finish matching the controls and the mains power switch is situated on the right hand side – accessible, but not immediately obvious. The aluminium casework is solidly built and includes well-considered mechanical earthing, which eliminates microphony. The only feature we weren't completely happy with is the supplied RC2 remote control. It's perfectly functional, however, and has the benefit of being a full-system remote, with enough buttons to operate one of the matching Unison Research CD players. Impressively the carcass is hewn from a lump of wood, though the main control matrix is secured to the unit with two ugly crosshead screws. More to the point, the buttons are small and stiff and on the verge of being unyielding. In the grander scheme of things, this is no big deal, and it's certainly no deal-breaker, but it could have been done better. Under the hood, the Nuovo reveals itself as being unusually well made. The heatsink, for example, is shaped to nestle snugly around the large torroidal transformer, while the volume has a long control rod, so that altering the volume using the front panel adjusts the volume at the input, avoiding transporting the audio signal from the back of the amplifier to the front, and back again. Most of the test work for this review used the excellent Triangle Quartet floorstanding loudspeaker and a Denon DCD-SA1 SACD player, which turned out to be completely compatible with the character of the amplifier. The best way to sum up the Unico Nuovo is that it does what it says on the tin. It has the qualities you'd expect of a valve amp, a hint of warmth and grace and a smoothness that is quite different from the sterility of a poor solid-state amplifier. What's really striking, however, is that it achieves this without going over the top. The warmth appears to flow organically from inside the music, rather than being laid on externally as though with a trowel. Imagery is expansive, but properly focussed and realistic in scale. It is the slight loss of focus and a residual inconsistency between the sound of valves and solid-state that renders most hybrid designs we've experienced as ultimately unsatisfactory and this even applies to most valve/MOSFET hybrids – though MOSFETs are widely regarded as being more valve-like than other solid-state devices. At the same time, the Unico Nuovo is fast, assured and dynamic. It is clearly not the most powerful amplifier in its class, but it will hold its own with most 100-watt amplifiers and with mid-efficiency speakers – the Triangle is slightly more sensitive than most, but this was confirmed with other speakers. With the Mordaunt-Short Performance 6LE, for example, there's always enough power in hand and it is always delivered in a consistent way with no hint of strain. The Nuovo has a natural flow and it sounds fast and assured on test, ebbing and swelling with the music. Stereo imagery has real depth and in the lateral plane, the sound seems to stretch without break between opposite walls. Coincidentally the Triangle Quartet has an unusual ability to suggest height, which is probably attributable to the unusual dispersion of the tweeter housing, but whatever the cause, the result is a tactile and three-dimensional image. If what you want from an amplifier is solid-state-like power delivery, leavened by the grace and polish of a good valve-based design, then Unison Research have got it on the button. The Nuovo offers an authentic taste of the high end at an attractive price, which is not completely out of step with the solid-state competition. Its sound is individual and more valve-like than transistor, but it has undeniable polish and verve. Above all, it is a thoroughbred, that makes unusually effective use of the two main technologies to make it sing.